Gala Dragalia will start 11:00 PM Mar 26, 2019(PT)/6:00 AM Mar 27, 2019(UTC). ・The initial appearance rate for 5★ adventurers, dragons, and wyrmprints will be increased to 6%, up from the standard 4%! If you get a 5★ summon or 5★ featured summon, the appearance rate will return to the initial 6%. ・Limited-time Gala Dragalia versions of adventurers will be added, available only while Gala Dragalia is active! 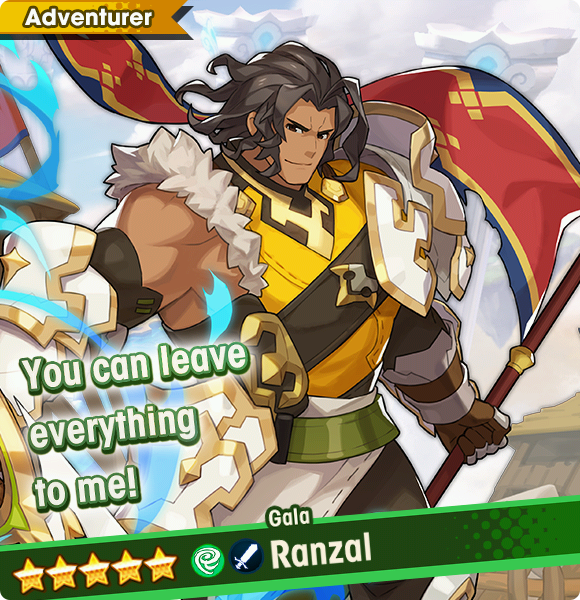 The featured Gala Dragalia adventurer is detailed below. Ranzal has been appointed a commander in the New Alberian army. He wears armor made by his friends, and has traded the axe of his mercenary days for a sword. He's still as boisterous as ever, but now has the dignity and presence of a leader. Note: Adventurers with the same name cannot be put into the same party.